PARIS, April 14. /TASS/. French police detained a total of 45 protesters during Saturday’s Yellow Vest demonstrations in Toulouse, the BFM TV channel reported citing the prefecture of Haute-Garonne’s department. Earlier reports said 23 people had been detained. According to the prefecture, 15 individuals were arrested for violating the rules of participation in the manifestation, in particular covering their faces with masks or other means. 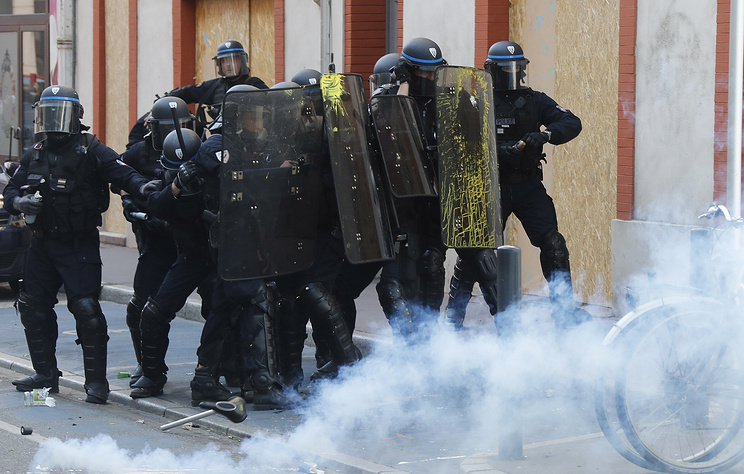 According to the latest data, 21 people were injured during the protests in Toulouse, including a police officer. On Saturday, a new wave of Yellow Vest protests hit France, drawing nearly 31,000 people, according to the French Interior Ministry. Like in previous days of demonstrations, protesters clashed with police. Toulouse was declared the capital of Yellow Vest protests on that day. Local authorities have not provided data on the number of protesters in this southern city, but the BFM TV channel puts the figure at nearly 4,500. The protesters expressed discontent over the national debate, claiming that French President Emmanuel Macron used the event as a platform to promote his own agenda. They demanded that the authorities announce particular decisions in the near future after contacts with regional authorities and representatives of the public.